Stucky Ridge, a series of grassy, wind-blown benches and timbered gulches located near Anaconda in southwestern Montana, provides critical winter range for elk, mule deer, and bighorn sheep, and is an important rutting and calving area for elk. The project area was divided into three separate weed management units: 1) low elevation, fragile sites with dense populations of spotted knapweed and limited desirable native vegetation; 2) environmentally sensitive sites near aspen, conifers, and water; and 3) areas that were best suited to aerial herbicide application. The Forest Service implemented an integrated program that included release of biological control agents on spotted knapweed on low elevation sites. About 1,000 Larinus spp. (seed feeding insects) and 2,000 Cyphocleonus achates (root feeding insects) were released in 2009. “Our hope is that the insects will slowly remove the spotted knapweed allowing natural replacement of native vegetation,” explains Rasor. More releases are planned for 2010 with continued monitoring of insect populations to determine establishment. Ground herbicide applications began in June 2009 with three different herbicide treatments including Milestone® at 7 fluid ounces per acre, 2,4-D at 1.5 quarts per acre, and Transline® at 2/3 pint per acre. Herbicide treatments were applied to 379 acres with a specialized off-road vehicle called the Land Tamer. The Land Tamer is equipped with two boom-buster application nozzles and a center single nozzle, which gives a treatment pattern of 55 feet and a total application volume of about 11 gallons per acre. “The Land Tamer allows us to accurately treat areas of rough terrain with a higher level of safety to our operators,” says Rasor. Results the year of treatment showed excellent spotted knapweed control with Milestone and Transline treatments, but poor results on sites treated with 2,4-D. 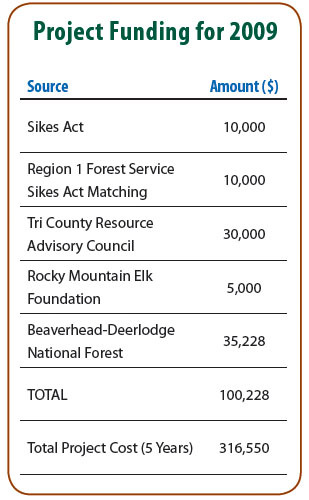 In September 2009 the Beaverhead-Deerlodge National Forest and Rocky Mountain Elk Foundation (RMEF) entered into a Stewardship Challenge Cost-Share Agreement for aerial herbicide application on 1,050 acres infested with spotted knapweed. With the help of the RMEF, a contract was issued to Heli-works Flight Services to apply Milestone at 6 fluid ounces per acre. “We reviewed results of our aerial treatments in July 2010 and had excellent control of spotted knapweed with the fall aerial treatments. The wildflowers, perennial grass, and sagebrush look great and healthy,” Rasor says. Funding for the project was also used to construct a jackleg fence and install a closure gate to help keep unauthorized vehicles from entering the area. This should reduce movement of spotted knapweed to non-infested sites and limit disturbance caused by off-road vehicles. The final segment of the 2009 project included purchasing materials to re-develop a spring in 2010 to provide water for wildlife during summer months. The Beaverhead-Deerlodge National Forest is proud of the partnerships and accomplishments in 2009. Total cost of the habitat enhancement project to date is about $72,000 to treat 1,429 acres of spotted knapweed, release 3,000 biological control agents, secure one road closure, and purchase material for a spring re-development. “We have money remaining from 2009, plus additional funding to put toward our future ground and aerial herbicide treatments and rehabilitation efforts. Our goal is to treat about 1,500 spotted knapweed acres each year through an integrated program, for a total of 5,094 acres over five years. Most importantly, the Forest wants to expand our partnerships and increase weed awareness with adjacent landowners and special interest groups,” says Rasor. Some states require an individual be licensed if involved in the recommendation, handling or application of any pesticide. Consult your local extension office for information regarding licensing requirements. Milestone is not registered for sale or use in all states. Contact your state pesticide regulatory agency to determine if a product is registered for sale or use in your state. State restrictions on the sale and use of Transline apply. Consult the label before purchase or use for full details.